On this date in 1940 a German Heinkel 111 was shot down and sank in the shal­lows off South­ern Eng­land. A water­logged X‑Geraet (“X‑device”) was recovered. The X‑Geraet played a role in the Battle of the Beams, a period early in the war when German bombers were equipped with increasingly accurate systems of radio navigation. Before the X‑Geraet there was the Knicke­bein (“Crooked Leg”), first tried out in 1939, which broad­cast guid­ance beams from occu­pied Europe that inter­sected, or crossed each other, at the point where bombs should be dropped on Brit­ish tar­gets. (The cross-beam develop­ment had its in­cep­tion in blind landings at air­ports in bad weather or at night.) Ger­man bombers would fly into one beam, or set of radio waves, and “ride” it until the radio opera­tor started hearing the tones from the second beam on a second receiver. When the steady “on course” sound was heard from the second receiver, the bombardier dropped his payload. Knicke­bein was used early in the Luft­waffe’s night-bombing cam­paign and was suc­ceeded by the four-beam X‑Geraet, which was simi­lar in con­cept, but it oper­ated at a much higher fre­quency and was used to greater effect. The Brit­ish city of Coven­try, with its 14th‑century Gothic cathe­dral, was its best-known victim, on the night of Novem­ber 14/15, 1940. The Y‑Geraet was an improve­ment over the X‑Geraet in that it used a single narrow beam from the ground station pointed over the tar­get. Day­time bombing could rarely achieve the accu­racy of these night­time bombing raids. By way of example, bombs dropped using the X‑Geraet were placed with­in 100 yards of the device’s centering beam, good enough to hit a large factory. The British scientific community fought back with a variety of its own increas­ingly effec­tive counter­measures involving jam­ming (i.e., throwing out power­ful radio noise over a wide range of fre­quencies to disrupt radio trans­missions), “bending” or dis­torting the German navi­ga­tional beams, and producing false signals that tricked the Germans into dropping bombs miles from their intended targets. Three consecu­tive raids on Britain’s second-largest city, Birming­ham, between Novem­ber 19 and 21/22, 1940, less than a week after the success­ful Coventry raid, were disrupted by jamming. British electronic wizards were slowly gaining the upper hand. But the Battle of the Beams and the back-to-back aerial duo Battle of Britain and the Blitz on British cities, especially London which was a large and easy target, really only ended when the Luft­waffe moved its bombers to the East­ern Front in May 1941, in pre­para­tion for Opera­tion Bar­ba­rossa, the attack on the Soviet Union and the harbinger of Nazi Germany’s ruinous end. 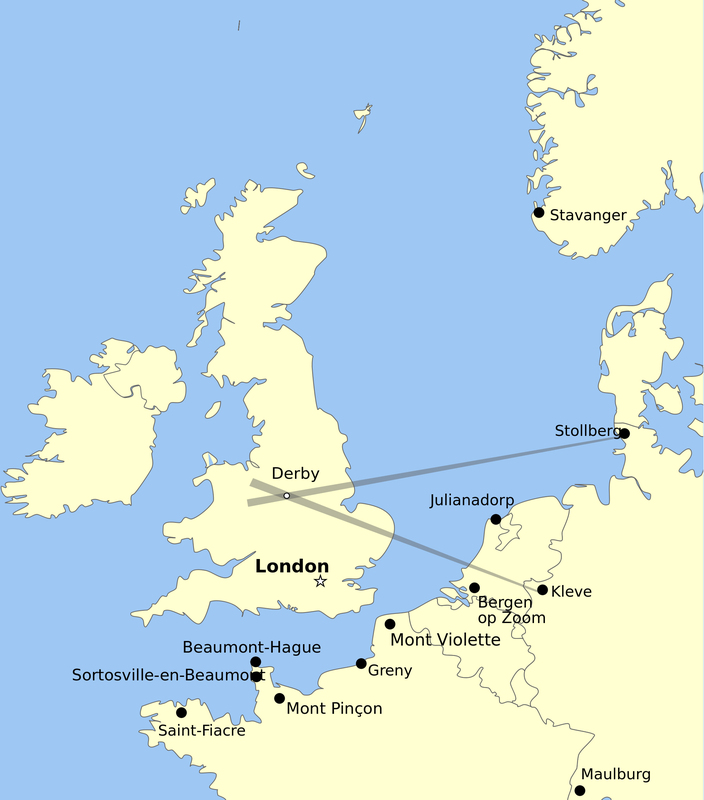 Left: Map showing Knickebein radio trans­mitters whose inter­secting beams were broad­cast from Schleswig-Hol­stein near the Danish border, at Kleve near the Dutch border, and at Loer­rach (south­west of Maul­burg) in Baden-Wuerttemberg near the border with France and Swit­zer­land. Following Nazi victories in Nor­way, the Nether­lands, and France in April–June 1940, the Germans installed addi­tional Knicke­bein trans­mitters in those coun­tries as well. The Knicke­bein was the pre­de­ces­sor to the more accurate X- and Y‑Geraet systems, which required new, more sophisticated radio equipment. Right: The X‑Geraet used a series of beams to locate the target, each beam named after a river. The guide beam “Weser” was intersected by a series of three very narrow single beams, the “Rhine,” “Oder,” and “Elbe.” The inter­secting beams accu­rately mea­sured dis­tances across the guide beam. The “Oder” and “Elbe” were spaced roughly 5 to 10 kilo­meters (3.1 to 6.2 miles) from the bomb release point along the line of “Weser.” The bombs were auto­ma­tically released on signal from the device. The British were able to defeat the auto­mated sys­tem by trans­mitting a false “Elbe,” so that the bombs dropped prematurely, miles short of their target.